0 Comment May 1, 2017 Like? Cricket Wheeler is an executive producer from the television industry who has experience working with brands and sponsors to help provide a professional video production and live streaming experience. Cricket is currently working on a “budget conscience system” for a 4 camera entertainment area called the “Ring Studios” which will be opening in Sacramento California in a couple of months. They have purchased an “inedible” old roller ink with an event space area and stage. There is a branding team working with Cricket to build the live streaming platform system to help producers live stream hige quality videos on a consistent basis. “The transition is well on it’s way” says Cricket in our interview. “I have seen the distribution value of since 2012 working with the Animal Planet channel and ABC… As an executive producer I’m responsible for all of the tools coming together. I always say if on the day of the show I have anything to do I haven’t done my job right.” Wheeler explains the process she goes through working with the crew, the audio guys setting up microphones and technical people, the talent and the stage the tools and “Imagining the show from beginning to end, how it will be laid out. Having every second accounted for and then being responsible for taking the show through post formatted for the network to satisfy the sponsors.” Event coverage and value from live streaming on a television style level is now dependent on knowledge translation to the YouTube & Facebook world. We are seeing success from YouTube Stars, people who are innovative and getting out in the public. But it will take a team of dedicated and knowledgeable video producers to take brands to that level. It’s important that I can see the possibilities in the live streaming market for modern EP in the live streaming and video production industry. A few years ago Cricket helped live stream the “Geekey Awards” with a 3 camera system using a wireless stablizer camera. Maximizing all of the oppurtunities. With the PTZ cameras, it does allow you to go down with crew and production labor is one of the most expensive items on the budget especially when you get into long days. Cricket recently hosted a panel on the live streaming industry where they used a PTZ camera to get a smooth audience shot. The people who want to own their content are not usually interested in the YouTube and the Facebook distribution model. But however, you need to create and feed those networks pieces of content to help lead your audience into a distribution model that you can monetize whether it be ads, subscriptions or pay-per-view. “An executive producer helps know what’s available and working the platform that works for you” says Wheeler. What a day looks like as a Producer? “A day at NAB? or a Day on the Set? I day preparing to launch the live streaming platform at the roller rink in Sacremento, California?” says Wheeler to the question. Wheeler is “another intelligent woman on live streaming” we have documented in our live stream. We talked about “Maximizing Oppurtunities” in the live streaming space. One of our favorite examples of sharing multiple unique live streams is SpaceX. SpaceX live streams two unique broadcasts: one for engineers and one hosted brodcast in laymans terms. Allowing the audience to select the camera they want to watch will be more important. The latest social media sharing tools are working for both live data display and polling but also quick video clip posting during a live show. Sharing a short clip a live show for free can help drive better engagement for your main content. During our live show we demonstrated live social media ingest for #VIPATNAB duing out live show. “Ingesting and posting in social media live is a huge benefit across the board for increasing your return on investment” says Wheeler. “We also use AMPLive” say wheeler and she explains the distribution and engagement benefits. So many of the new features allow streams to embed video links for purchases online although many new. AmpLive is basically able to guarantee views and what they do is take your content and syndicate it out through large publishing websites relative to your topic or brand message. With all of the pletera of video content now available with websites like YouTube and Facebook, people are now looking for things that are authentic and more real. Live offers the combination of authentic and interactive with audiences that has a great return on investment for everyone involved. 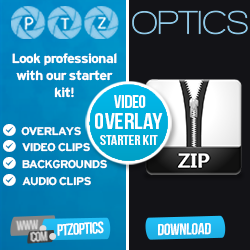 Tess Protesto: Hello everyone, welcome to PTZOptics live, I’m Tess Protesto, we stream live every Friday from YouTube at 2:pm Eastern, 11:am Pacific, with the exception of this week and I know I’ve said my [00:48] so many times this week, it’s like on instant replay but we are streaming this week live from the 2017 NAB show Paul is there right now, our chief streaming officer to bring you the latest and greatest, in broadcast, AV streaming, Tech Gear Awesomeness, so let’s take it over to Paul and see what he’s got going on. Paul Richards: Hi Tess, how are you doing today? Paul Richards: Today is the last day of the NAB show and it’s a short day actually, it ends at 2: Pm and a little bit sad, but every day of the show is an adventure and a fun time and guess what I have with me and executive producer Cricket Wheeler and she’s from a company called Drop into Digital and we’ve been having some really interesting conversation from the producer side of things, and I wanted to just go ahead and introduce you and get your take on the show and what your company does. Cricket Wheeler: Okay, just thanks for including me in your show, Drop into Digital helps maximize …helps people create live streaming platforms based on the technologies that are available, bringing in brands and sponsors and creating content that then can be pushed out through social and branding and monetized. Paul Richards: I know, so we were at the Las Vegas, it’s called [02:35] kind of like a gym membership were you can pay to be a member but instead of going into work out, there is actually camera’s and microphone’s and producers and people to help you can kind of learn how to live stream your show and it’s been a great place for small to medium size talk shows, who can kind of get their audience because they can get the production value up at that point and at a low cost, we were just talking to Cricket about a system where, again kind of a budget conscious system but with 4 camera’s for a concert kind of entertainment area, can you tell us a little bit about that and how your role is in that project. Tess Protesto: You’re back now. Paul Richards: You can hear us? Paul Richards: Ahh, you jinxed us Cricket, hopefully most of that was captured there, and this is just one example and I think one of the prime examples is the affordability of PTZOptics but still the 1080p quality so you can create that content in a high level of video production and I’m interested, I don’t think we’ve dug into your role as an executive producer because not everybody gets that and you know, we produce a lot of this stuffs our self, have to do all the work and it’s a full time job. So for a corporation …Tess is laughing because she has to do a lot of it herself. So for an executive producer, can you tell us about the value that you bring to some of the larger shows with larger video productions that need to have somebody working all the angles, how are the brands going to come in, how are the sponsorships going to be taking care off, when are we going to do a commercial break, and how has that played out in the live streaming world because I know you have a TV background but now you are kind of trying to translate some of that industry knowledge into the live streaming world, I’m interested to see how those 2 worlds come together. Tess Protesto: there is a strange transition happening right now and it is interesting. Paul Richards: So I’m hearing a lot here and I’m really, really interested in it here, how that knowledge and how that workflow translates into the YouTube and Facebook world and the Instagram world that we live in, so let me just ask you some questions to try to pull out some of the things I’m looking for here. So you’ve got all this great experience and you’ve had millions of viewers back in the day before Facebook and YouTube, now were in the days, at a time where YouTube and Facebook have the Largest audience of everyone and they are really pushing live streaming into their platforms and we’re seeing success from YouTube stars, people who were innovating and getting there before everybody else, but there are also a lot of times that the successful once have a lot of high quality video productions and they are using multiple cameras, so now I see …and I wanted to just …follow me here if you can, now you’re setting up a concert right? And so it seems like …and now your role is changing slightly because now it just for example you had 6 camera’s and a video truck and a huge crew and the way that technologies work you can have one person operating 4 camera’s with a joystick, so one person on the joystick operating 4 camera’s, you’ve maybe got 1 person doing the video switching because it’s maybe a tricaster and they say that one person can operate a tricaster, so you are down to a 2 person crew and If I’m getting this right, you are kind of like the eye above, you are the owl above, you have already made all the decisions on let’s say the set design, with the lower thirds or the creative control and now so you …I’m guessing as this project go forward there is probably a less amount of crew right? Because you don’t need a camera operator for every camera with the pen tilt zoom cameras but you’re probably reaching larger audiences on a lower budget in a nutshell, and can you kind of tell …is this your first project with the PTZ camera’s or can you just kind of explain how …because I think the transition in general is going to be less man power needed, lower cost equipment but you can reach a larger audience, so the value is even increased more, less up front budget, higher return on investment, depending on how you do it and I’m also interested on how you help your customers monetize their situations too, so I know I’m throwing a heck of a lot at you but there is that transition there from the 6 camera operators and the huge TV truck at Hollywood, to a refurbished roller ring where we are putting 4 PTZ camera and a tricaster in and we are still creating a high quality television production but we are only spending less than $10,000 and like you said we can produce content everyday with just 2 people and the talent as oppose to a 10 man crew so just kind of explain to me how that transition has been like for you from the executive producer stand point. Cricket Wheeler: it’s important that I understand the capabilities of what’s out there and that’s why I love to come to NAB because if I can’t see what can be done then I really can’t deliver for my clients or find the crew or the live production team that can deliver what we need, but I really believe that a lot of the production can encompass every single level that you described, so for instance, I did a live stream at [12:07] awards a couple of years ago, so we had a fly pack and we had the whole tricaster set up we only had I think 2 or 3 camera’s I had instead of the [12:17] I had a single hand held on a ready rig, I don’t know if you guys are aware of the ready rig which is a new camera stabilization system and there are over at the DJI booth now with all of the [12:31] but anyway so instead of …they couldn’t afford a Jeb so we had that, so everything from this level and then I had a single camera streaming through live view all of the red carpet interviews and then they move to the back stage, so we actually had 2 channels going at the same time plus the fly pack, so you’ve got the single, you’ve got the fly pack, you’ve got the truck, so to me, it is maximizing all of the opportunity so with the PTZ cameras it does allow you to go down with crew and production labor is one of the most important or most expensive things on the budget, that lying item is the most costly especially when you get into long, long days. So I recently, I recently hosted or moderated a panel on streaming for the Carcass for producers, writers and directors in Hollywood and so I had a couple of wonderful people on the panel who had been in the streaming environment for quite a while and we had …I used a company called Absolute Live Productions in Los Angeles and they are that middle group that you’re talking about and we had a PTZ camera for the audience shots and so when we did the Q &A with the audience, it worked great, so it’s really about maximizing all of the opportunities and I think that a lot of the bigger content, the shows, I think that the people who want to own their content and monetize their content are not interested in the YouTube and the Facebook distribution model, however you need to maximize and feed the content to those channels to drive back to your main platform that then you can monetize, whether it’s through ads or subscription or pay per view or something like that, so it’s the combination, it’s the entire landscape and that’s what I try to do is to know what’s available and for every single client that I’m working with I’m developing that platform from them, using the different once at different times as you roll out content. Paul Richards: you know sometimes it really does take an executive producer to look at that because from Tess and I’s prospective we’re just streaming to YouTube ever Friday at 11am Pacific and its super fun but from an executive producers stand point you’re looking at it from such a higher level, some of this conversation I’ve never had before so I really appreciate you being here and sharing some of this information. Do you have any questions for Cricket, Tess? Tess Protesto: Well my questions are more selfish, I’m just very curious about what a day looks like for you especially being such an establish and experience producer, am just so curious. Tess Protesto: First off, I don’t feel sorry for myself anymore about having to edit videos after hearing what your normal schedule looks like about what goes into everything that you’re in charge of, I’m extremely impressed, and I wanted to tell you that everybody in the chat is very impressed with you [15:50] is most impressive guest, very efficient. Cricket Wheeler: I’m ticked, I’m tickled, one of my client is purchasing the PTZ optics so it was important for me to know how to maximize the features and that’s why I sat by the booth so it was great timing. Paul Richards: Thinking about it, from like maximizing opportunity stand point, so one of the things that you mentioned that I would highly recommend of course we don’t do what you do, we’re stepping into your shoes and putting your hat on and seeing what an executive producer thinks about when it comes to live streaming and monetizing and doing all this things, and one of the things that you mentioned and I think it’s really powerful is like, let’s say you’re doing the red carpet and then there is a big show as they walk in, maybe you live stream the celebrity walking in the red carpet on YouTube and Facebook, get that large appeal and when it comes to the time for the show you know, we’ll use a premium network with a paywall so that the content can be monetized, the other thing that you mentioned was possibly having 2 live streaming going on at the same time, that is something that I’ve been very interested in and I’ve actually done a little bit of playing around with, some of you may have seen our show where we live streamed, you can live stream up to 6 different streams to YouTube on the same event, so the user can choose which stream they want to watch and one of the best example of this I’ve ever seen, now we’ve done it a few times just to show it works, but one of the best examples I’ve ever seen is Space X, they live stream the rocket launchers and they know that they’ve got a really techy engineering audience and they’ve got everybody else right? So they actually host 2 completely separate live streams, now they are not monetizing it, this is just a public thing and you get to choose on the right hand bar, I’d like to watch the technical broadcast or basically the hosted broadcast where they are explaining it in layman’s term so stuff like that is mind blowing what you can do. Cricket Wheeler: I think that the larger streaming technology that will offer multi-view options where the viewers can choose which camera and angle they want to watch is obviously being used widely now in concerts and I think as technology become easier and more reachable, that same feature will be offered in more and more platforms, there are so many incredible streaming platforms coming out and they are adding features by feature, by feature and what the feature that are important to me as a producer are those that say may minimize post for instance, so if the live stream, if I can create a shareable clip instantly from a live stream and then send that to the social network, you can do that clearly in the pre-show but then during the live show so you’re instantly being able to create a high light and with this shows going on so long you can obviously still push people back to the main event, so it’s those features that I think is important for me to understand and maximize that content to connect the social with the main content. Tess Protesto: Of vMix social? Paul Richards: yeah I was thinking maybe you could do a desktop capture of the browser input that shows all your Queued things we can show that to Cricket, but Cricket that’s the question in a nutshell, social media integration from an executive producer idea, posting out to YouTube, twitter, Facebook and then also bringing it, so you’re posting out and you’re injecting it and showing live the tweet and everything, from your perspective, I guess you’re still learning about a lot of this integration, but you’re bringing up just so many good ideas. Cricket Wheeler: Well I love Easy Live, they were in [22:00] last year and they are the once that showed me that you could do that and since then I’ve talked to other streaming platform about doing it and so it’s actually I know it’s going to be developed by two other streaming platform, so they rock it, they really do. In terms of the social, wait, what was the question? I think it’s all important, I think the injecting and posting, they cross aboard, so what I like to do is to explain to people that if you’re in a live stream, that the interactive component of it is what drives people’s engagement longer and there are going to stay engaged and then that’s just a return on investment for whatever the purpose is you’re doing the live stream. So we are setting up a the live stream that we’re going to do may 12 from a [22:57] organization in California, it’s called [23:01] and the sponsor is Natures energy that has Prenatal Vitamins and we are distributing also on Mom Live TV, so as well as all of the social, so we are using switchboard, to go out to all of the other destinations at the same time and we’re sending over to AmpLive to boost the audience, and the entire time we will be taking questions from all of the Facebooks from the [23:27] Mom Live TV and Natures Energy Facebooks, integrating it and so all through the live stream, so I’m producing the live stream, so we’ll have different sections, different content and each time there will be Q and A throughout the whole thing were we actually stop and interact with the audience and hopefully keep them on longer for engagement purpose, and so that’s a way I like to integrate it so, and at the end of course, everything will be clipped and posted for a very, very long time, around certain subjects and themes, so that’s I guess an example. Paul Richards: You keep bringing up …Tess we’ll have to extend the show a little bit and then we’ll roll the credit after this question I guess because you keep bringing up really good point and we would love hear from …you are not exactly an end user but you are basically the end user’s ambassador like you want it all to work for the end user and that’s why, that’s why this conversation has been so productive, I honestly have never talked to an Executive producer in the streaming space so I don’t know where you guys all are but maybe we should set up a second …if we could have you on the show again possibly, so here is my question, I got two question for you, the one question is, so you’re working with sponsors? How do you keep the sponsors happy? What are the sponsors looking for from a ROI stand point, and the other question, I just wanted to ask you a little bit about AmpLive because I’ve heard about it but I’ve never used it, and I’d love to hear about that as well. Cricket Wheeler: In terms of keeping sponsors happy, it really depends on what their mission statement is, because some of them are in it just for branding purposes for image, and associating with a certain kind of content, whether it’s educational, or entertainment, they will sponsor that just basically to reach their potential customers, but it’s more of a brand image, then of course you have the direct sales and so many of the features now in the live streaming with just a click you can either go to their portal for retail sales or you can just identify the products with a layer, in some of the posted content, you can click on it and it will tell you exactly where it came from and where to purchase it, so it really depends on what their mission statement is. when we were working with [25:46] which is no longer sponsoring the American Kennel Club shows but they were just interested in the perpetuation of the pure breed dog and so a lot of the content that we created for them was to really explain the value of having a pure bred dog and then of course the perfect pure bred dog was healthy because of the food they eat so it wasn’t direct sales, we didn’t push direct sales through that at all, but obviously it’s available with the new technologies. Cricket Wheeler: Oh AmpLive is a great service, they started …they were at [26:23] and so you basically are able to guarantee views and the views are not random and 2 second clicks, that kind of thing, the valuation of AVU is a very high standard with AmpLive and what they do is that they take your content and send it out across a network of publishers, so in the old days where you’ll have agencies buying ads across a selection of magazines or newspapers and thing like that, they in essence take your live stream and place it on publishing sites, so if you’re streaming something, will be streaming in the Natures Energy, Prenatal Vitamins, and we are going to use AmpLive and so we will be pushing the live stream out to whether it’s Huffington Post or one of the parenting magazines, so they have an entire retail or online presence publishing that we published the actual live stream to so when anybody opens up that publishers site they see the live stream and so you are guaranteed views but they quality views is a very niched audience. Paul Richards: the last thing we will end on, clearly you would do that because of the fact that live video, there is something special about it? Right? There is something different about it that is working. Cricket Wheeler: And that is, you can be interactive and also it’s organic in nature, I think with all of the Plata of content that has been generated from YouTube and Facebook and everything else, people are interested in Authentic content, if it’s too polished, it’s too live, to dramatic, and it’s not real, it doesn’t hold the audience anymore, so that’s what we try to do is create …and I think Live does that, so Live offers authentic and interactive and that right now is where I think you get the best on ROI whatever the investment is. Paul Richards: wow, we have to roll the credit, Cricket, thank you so much for stopping by for that interview, I would like to have you on this show again, Tess is taking notes so that could have changed the outcome of our show in the future, well let’s have you on the show again if you have time we can interview you, I want to stay in touch, make sure you get my card before you leave, and we’ll go onto the post show, we have a giveaway to announce, thank you so much Cricket. Tess Protesto: Thank you so much, and thanks everyone for watching. And that’s all folks we appreciate your participation in the chat room and can’t wait to host our next informative Q & A session, your question drives the conversation forward for live streaming professionals around the world, until next time, Happy Streaming!! !